Mashreque – What is it? Brown.British.Clown.Skittish – The musings of a somewhat introverted chocolatey person who has been wandering around London for the last 30 years..
Clowns to the left of me, jokers to the right.. I have been fuming most of this week due to a fellow British Bangladeshi, Nadiya Hussain who this week won the current series of The Great British Bake off, being used unfairly for political capital both by the left and the right for their respective agendas. Whilst comments from the far right were pretty predictable, the usage of her by the left just illustrates how a lot of the left on their “social crusades” actually do more harm than their intended good. Let’s not get it twisted, she was a deserved winner. Born in Luton and currenly residing in Leeds, she is BRITISH and not an immigrant. She is the daughter of immigrants just like I am but feck it aren’t we all kin to immigrants somewhere along the line? From what I observed within my own friends, she was loved for her personality, hilarious facial expressions, being a great mother, a great wife and all that jazz. 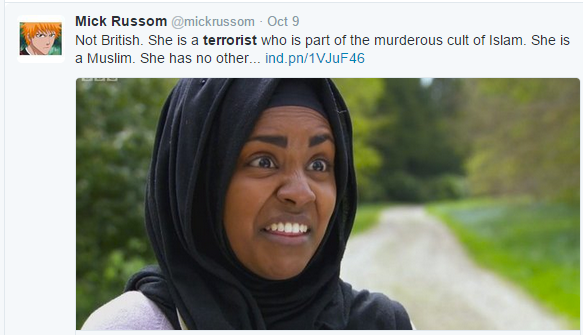 No-one gave a crap about her race, her hijab, or anything and just like the majority of public loved her for her and her baking skills. She won a national baking competition, simple as that, nothing more, nothing less. Just one comments from the right, most are highly predictable highly disgusting so I don’t really want to post many of them but to be honest the far right and any parties representing them are quite far away from gaining any power with possibly the exception of UKIP who are internally combusting, so largely we can laugh at them. Now who is in the wrong here? No it is not George Osborne or Theresa May. It is Paul Richards. Why? Firstly, because well if that was true, then the Home Office would have to send her home to…Leeds. Secondly, Paul said this comment because it was HE who looked at Nadiya, weighed up her colour and her hijab and then made the “send her home” comment. 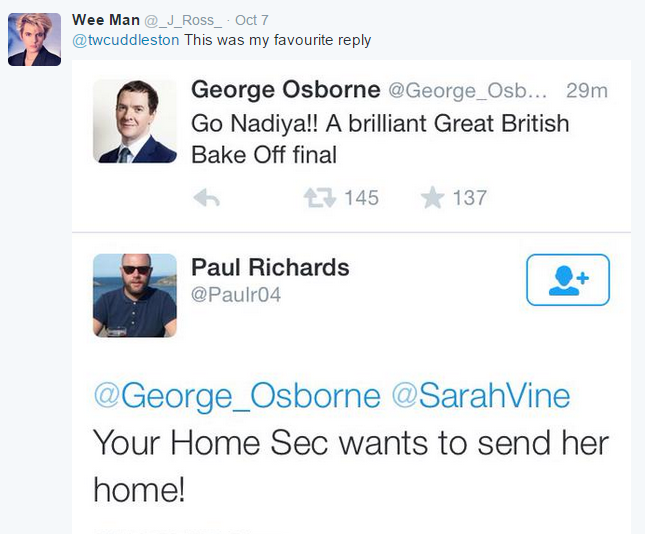 So it was Paul who was guilty of whatever he was insinuating Theresa May or George Osborne of. The next day there was an article, one of many http://www.independent.co.uk/news/people/nadiya-hussain-wins-great-british-bake-off-twitter-users-troll-theresa-may-over-the-great-british-a6685656.html that gleefully reported how many people happily ‘trolled’ Theresa May over her speech on immigration citing Nadiya. Why? Why did they cite her? all those trying to call her out with comments and tweets like in this article are ironically more complicit than May in the insinuations about her that they are making. It is THEY who are turning a show about baking into something political based on her appearance. It is THEY who are suggesting she is an immigrant when in fact she was born in erm.. LUTON. Did Theresa May say she was going to chuck out anyone born in Luton with a brown face? No. Did she say she was going to chuck out anyone with a headscarf? No. Again, why? What is the point and relevance of this? 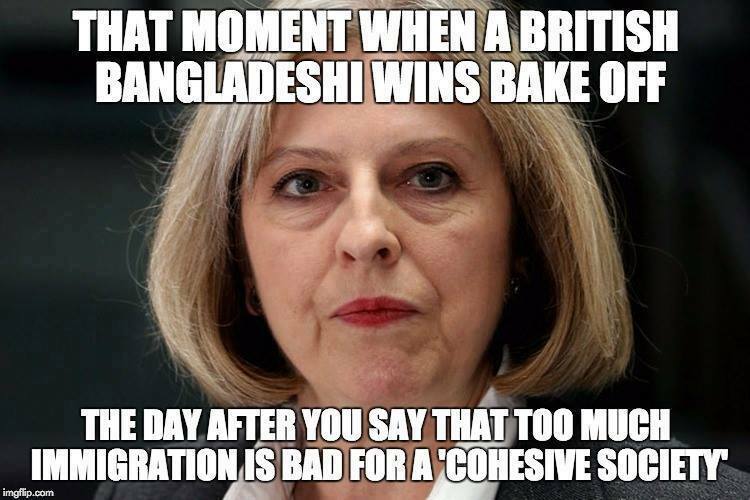 What has her winning a baking competition got anything to do with immigration or a cohesive society? She is not an immigrant. Why is her heritage been pointed out? Why can we just not congratulate her for what she is , a damn funny woman with a great personality and evidently a great baker. Using her as political capital for either side of the immigration debate is f**king patronising to her and trivialises the whole debate. She did not ask for nay of this and it is so unfair to drag her into the whole mire. She is just a British woman getting on with her life like the rest of us so why is she and her achivements being brought into this? But like I said before, it all highlights the hypocrisy of the left who also use someones race/religion for their own gain without thinking of the consequences. Usually the people who may say these things or make certain rules and decisions on behalf of certain parts of the population will have never or will never walk the shoes of someone who it will affect. Racism will never go away if race is constantly brought into the equation. Yes there is still some institutional racism out there but we do not need this victory to say it will improve race relations and whatnot. It is not fair to put that burden on her and it also insults the vast majority of the British population of all walks of life who generally all get on. Christmas will offend Muslims/minorities – Non muslim council/government workers/schools decide to tone it down. Did Muslims and minorities in their droves ask for it to be toned down? No. Who will get it in the neck? Muslims. Move that RAF soldier from the ward because it might offend – Hospital workers make this decision. Did anyone else pipe up? No. Who will get it in the neck? Muslims. And so the list goes on. And therein lies the problem. You cannot combat marginalisation in society with..marginalisation. Everyone should be treated equally. Ffs, Muslims have been around in the UK for decades and we just want to be treated the same as everyone else but with decisions like the above, all it does is creative a narrative that Muslims have asked for x,y and z and that becomes the populist view. I mean don’t get me wrong. Some of the aggro we get is brought on by ourselves. The whole terrorist stuff, thats a whole different melting pot altogether but our daily lives for all concerned is not helped by unnecessary tension caused by the likes of the above. I am just trying to make the point that however good peoples intentions are, by using a persons race\religion, picking it out to make a point is kinda racist itself. We have legislation here to protect discrimination on the grounds of race, religion etc and rightly so and this should be applauded and as a nation I think we are miles ahead on this front compared to America or a lot of Europe but sometimes the strive to be overly PC just causes grief to the very people you are trying to help. The media? Let’s not even go there. And you know what is offensive? That other people and institutons that more often than not aren’t Muslim or whatnot will decide on MY behalf what will offend me and what my sensitivities are. Do feck off. (E) SOCIALLY INTERACT WITH ME! The eve of Article 50 – Post-Referendum thoughts. From the UK with love..
jayla74 on A (love) story.